Audi’s pre sense basic is a system which detects when an emergency manoeuvre is being made and prepares the vehicle and its occupant restraint systems in advance of a possible collision. The braking and stability control systems provide continuous feedback to the system regarding the longitudinal and lateral acceleration and deceleration. At speeds above 30km/h, if these systems identify a critical manoeuvre, typical of a driver response to a likely collision, pre sense basic uses electrical pre-tensioners to remove slack from the front seatbelts. By doing so, they prevent the occupants from moving to a position in which they are more likely to be injured if a collision occurs. The electrical pre-tensioners used by pre sense basic are reversible and different from the single-use pyrotechnic pre-tensioners deployed during a crash. If no collision occurs, the electrical pre-tensioners retract and driving resumes as normal. Two levels of seatbelt tensioning are available from the system, depending on the criticality of the situation. The lower level can be disabled by the driver but the higher level always acts in highly critical situations. In cases where high lateral accelerations are detected pre sense basic also closes the side windows and the sunroof. This helps to prevent foreign objects coming into to the passenger compartment in the event of a side collision. 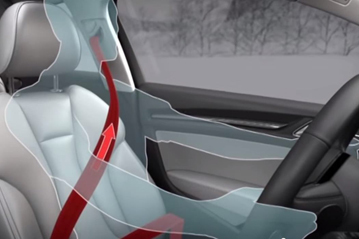 Occupant positioning is critical to effective protection during a collision: systems such as seatbelts and airbags do not work as effectively if the occupants are displaced from the expected sitting positions before the impact. However, the emergency manoeuvres often made before a collision, such as swerving or hard braking, often lead to out-of-position occupants. It is estimated that, if a system like pre sense basic were fitted to all cars on the road, the system could help in addressing some 4000 fatalities and around 20,000 serious injuries. Pre sense basic is available only at speeds above 30km/h. Protection provided at lower criticalities is not provided if the driver chooses to deactivate that feature. Track testing was used to ensure that pre sense basic intervened in all cases where an emergency manoeuvre was being made. Track tests were also used to monitor occupant displacement during emergency manoeuvres such as hard braking and swerving, and to assess the benefit of electrical pre-tensioning of the belts. Information from these tests was then used to conduct sled tests with dummies to show what the influence was on likely injuries of being out of position at the start of an impact. Extensive real-world driving was done by test drivers to ensure that there were no false activations of pre sense basic.